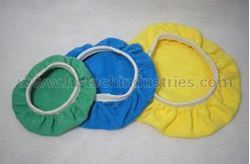 Microfiber Orbital Bonnets provide a deep high gloss shine. Use for removing wax and polishing/finishing chemicals. Available in 2 different sizes: 9" & 11".